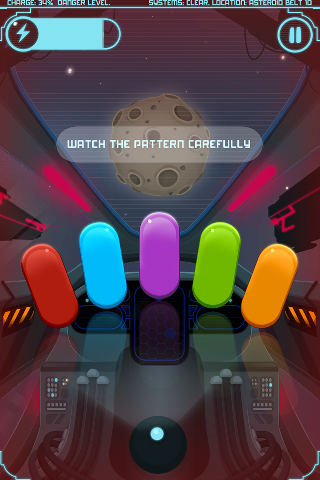 Danger Light - See how good your memory really is in this intergalactic puzzle game. Watch the flashing lights and repeat the sequence when it's finished. Played your game for a bit. Repeat game. Nice sprites. I did get mildly annoyed at the music while playing, as I try to remember tones as well as colours, but with the music playing as well as the tones, it added a layer of confusion. I also missed having a score and a high score value! It's a simple mechanic, but one that gives a user a reason to come back and play... With no record of your highest score to give you a goal to aim for each time you play the game, there is no real point to playing it more than once or twice, imho. Reminds me of that one game with Michael Jackson in it, except more phone-gamey. Also reminds me of that one level of Alien Hominid that I could never beat.